The HoloMonitor® system is based on the principle of phase-shift imaging using holographic microscopy. Phase-shift images enable the non-invasive visualization and quantification of living cells without any stains or labels. The rationale and advantages of using this technique for kinetic studies of cellular events are described below. The true power of time-lapse cytometry – making cells visible without labels or stains - combination of quantitative and visual data collected over time. A time-lapse image sequence of an unstained DU145 cell undergoing apoptosis induced by etoposide. The images were captured using a HoloMonitor time-lapse cytometer. Just like water waves, light waves have two principal characteristics: amplitude and phase. Amplitude corresponds to light intensity and is the height of the wave, measured from crest to trough. Phase measures, at a specific location, whether a wave is currently at its crest, in its trough, or somewhere in between. For a cell to be visible to the naked eye or in a light microscope, the light arriving from the cell must differ in amplitude from the light arriving from the background. Unfortunately, living cells are transparent and change the amplitude of the illuminating light only slightly, if at all. To be visible in a light microscope, cells must therefore be stained to absorb or emit light. However, unstained living cells do distort the light passing through them, by shifting the phase of the light. By using a special kind of microscope, a phase-contrast microscope, phase shifts can be observed, making unstained cells visible. However, phase-contrast microscopy cannot quantify phase shifts, only visualize them. With current computer technology, it is possible both to quantify and visualize phase shifts in phase-shift images. This technique is called quantitative phase-contrast microscopy, to be distinguished from non-quantitative phase-contrast microscopy. Unlike conventional phase-contrast microscopy, this new quantitative counterpart can give both quantitative data and beautiful images, transforming phase-contrast microscopy into a quantitative tool. Several different techniques can be used for quantitative phase-contrast microscopy. The most common of these is holographic microscopy, which is used in HoloMonitor time-lapse cytometers. Besides being able to create phase-shift images, images created by holographic microscopy are focused when viewed, not when recorded. This makes holographic microscopy ideal for long-term observations of living cells using time-lapse microscopy, i.e., serial images acquired at regular time intervals to capture the dynamics of various cellular events. Unfocused images, caused by focus drift, are simply refocused by letting the computer software recreate the image. 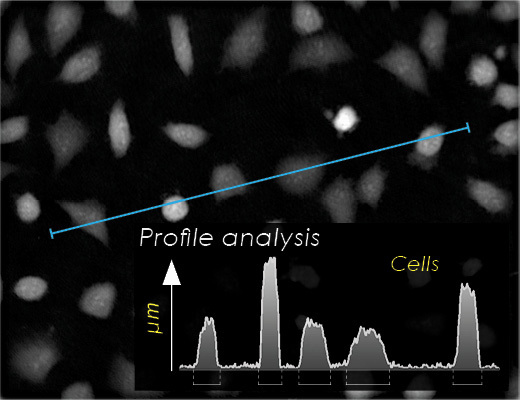 In the line profile of a traditional phase-contrast image, the background value cannot be accurately determined and a characteristic bright halo is seen around the edges of the cells. In this type of image, individual cells cannot be identified, i.e., cell segmentation is impossible. In contrast, holographic phase-shift images can be quantified because they reflect the optical thickness of the cell and optical density variations in the specimen. Additionally, holographic images have a background level of zero and the intensities of events are measured as positive values. HoloMonitor methodology enables reliable cell segmentation through the identification of individual cells, shown in the image by yellow cellular boundaries defined by a proprietary software algorithm. 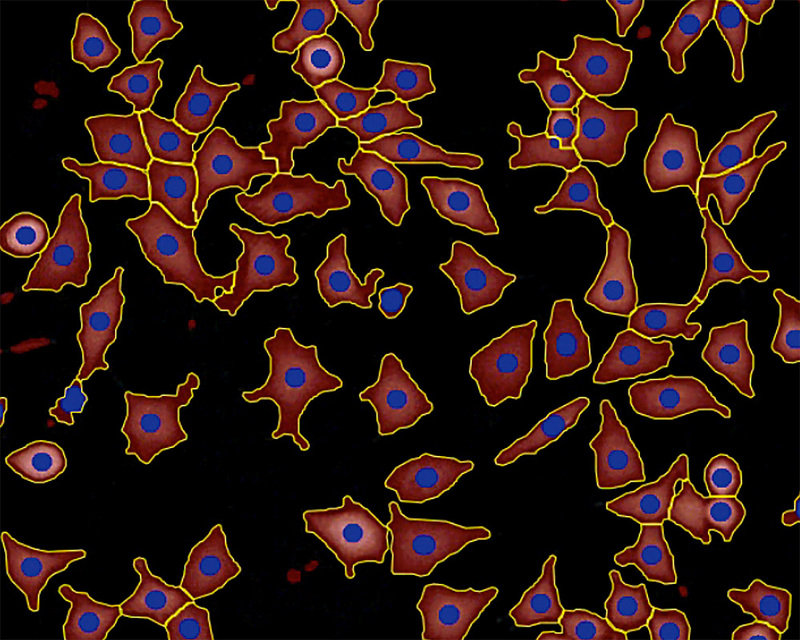 Example of a HoloMonitor 3D phase-shift image of cells. The height of the cell and its color tone correspond to the phase shift, at a specific image point. The phase shift in turn is proportional to how much the light has slowed when passing through the cell. The described principle of phase-shift imaging is the key to gathering quantitative data on cell characteristics. However, the true power of image cytometry first emerges when several images of the same cells are recorded over time. The HoloMonitor design utilizes recent technological advances to allow time-lapse image sequences of cultured cells to be effortlessly recorded over long time periods. When a HoloMonitor® time-lapse cytometer is installed in a cell incubator, kinetic data are obtained using time-lapse imaging, i.e., serial images are acquired at regular time intervals to capture the dynamics of what is being observed. Images can be recorded at flexible intervals, down to 1 image/sec, depending on the application, and played back as a video recording at different speeds to aid analysis. From recorded time-lapse sequences, the HoloMonitor software helps the user automatically extract individual cell data from data on a cell population. Individual cell data – for example cell count, cell morphology, cell velocity, and cell division rate – from a single time-lapse video recording can be used in a range of applications. Continuous monitoring – Time-lapse cytometry allows cultured cells to be continuously monitored before and after treatment, minute by minute. For example, by repeatedly measuring individual cell volume and cell morphology, the developing health status of a treated cell culture can be monitored without removing it from the cell culture vessel. Supporting video – With time-lapse cytometry, cytometric data can be accompanied with supporting videos that visualize, for example, how cancer cells shrivel and die after being treated with a cancer drug. Real-time observation – Visual information can reveal, for example, whether the cells really shriveled or whether they died in an apoptotic explosion. Unlike flow cytometry, time-lapse cytometry can immediately reveal such information by allowing the observer simply to watch the cells as they die.